Did you know that the vast majority of homes in Oakhurst are historic—and that federal and local programs provide economic incentives for their renovation? 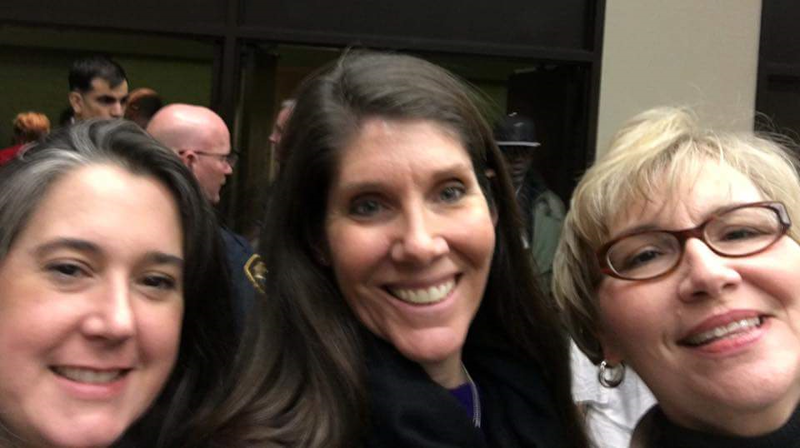 At last Thursday's ONA meeting, City of Fort Worth Historic Preservation Officer Liz Casso spent some time addressing that topic. Click on the image below to view her presentation. 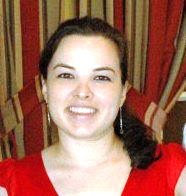 In 2010, Oakhurst was designated a Historic District on the National Register of Historic Places following the approval of a professionally-researched nomination by local historian Susan Kline. Of 710 houses in the neighborhood, over 530 are considered “contributing” structures to the district. This means those houses have retained a substantial amount of their original architectural integrity since the time of their construction (1920s-'50s). The two additions comprising our neighborhood, Oakhurst and West Oakhurst, are considered to be a visual encyclopedia of housing styles from those decades. Tudor was the predominant style in the original addition, accompanied by Bungalows, American Folk, and Ranch Style. For more information on this topic, scroll to the bottom of our Oakhurst History page. You might also be interested in the Gallery of Homes. The National Register listing makes income producing properties in Oakhurst eligible for a 20% investment tax credit when substantial rehabilitation is performed on those properties. 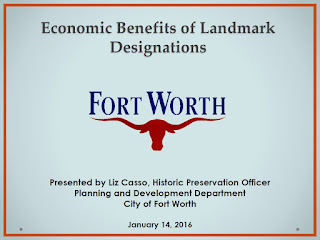 Additionally, the City of Fort Worth provides a Historic Site Tax Exemption to homeowners performing substantial renovations on historically-designated properties. To learn more about applying for a historic designation for your property, visit the City's Criteria for Historic Designation website or click on the links below. The Charm of Oakhurst: "Homes on a Hill"
The enclave of curving streets, well-tended flower beds and charming houses is one of the best kept secrets in Fort Worth. Yet Oakhurst, a neighborhood of about 2,000 people a scant two miles northeast of downtown, is a highly visible force at City Hall when there's a battle to be fought involving the neighborhood. The brick and wood-frame houses and mature trees resemble those in Arlington Heights, another established Fort Worth neighborhood attracting young families and enthusiastic refurbishers. But until recently, Oakhurst escaped the housing inflation common in near west Fort Worth's older neighborhoods. It has retained its eclectic combination of $200,000-plus brick homes perched on scenic bluffs just blocks away from small, under $60,000 homes whose front yards are littered with tricycles. "The area has some of the nicest homes on this side of the city," said Khosrow Keynejad, the associate city planner assigned to the area. Oakhurst's sector plan for the future emphasizes protection of the borders of a "valuable residential neighborhood." "I've always been Charmed by (Oakhurst)," said resident Gary Kutilek, assistant city parks director. The Kutilek family has lived in Oakhurst for nine years, first as renters and later as homeowners after Kutilek spotted a "for sale" sign going up in front of a Bluebonnet Drive home and asked the owner to take it down so he could have first shot at purchasing it. Often overlooked by people unfamiliar with Fort Worth, Oakhurst's close-in location and well kept homes have become lures. Blessed with easy access to Interstate 35, residents can reach downtown in less than five minutes. When at home, they find a peaceful retreat with sheltering trees and familiar neighbors. Although the 1980 Census found Oakhurst's population down by almost 400 since 1970, the number of owner-occupied homes has climbed from 78 percent to 87 percent—a characteristic that gives a neighborhood stability and, generally, better maintained properties. Perhaps the only drawback, said Keynejad, is the lack of nearby shopping. On Oakhurst's west side, the streets curve and climb up steep hills. Residents decorate the triangles of grass at intersections with flower beds. Many homes are brick and have steeply pitched roofs. One house on Daisy Lane looks like a cottage, its covered porch dangling lush flower baskets and its roof topped with a weathervane. Farther east, streets straighten out and meet at right angles, but the large trees remain. Wood-frame and smaller brick houses are home to retired couples and the occasional renter. Front yards covered with toys give away the presence of families with young children. A key factor that shaped Oakhurst is its unique topography, officials and residents say. "Nature helped Oakhurst: topography helped them," said Keynejad. "Geography is always a major factor in urban planning. Oakhurst sits on a bluff which protects it on the south," he said. Interstate 35 is to the west, but the neighborhood's altitude insulates it from traffic noise. The Mount Olivet Cemetery to the north offers additional protection. Although industrial and strip commercial development have sprouted in neighboring Riverside, Oakhurst's geography has kept the neighborhood largely residential. The biggest threats it faces are commercial encroachment from Sylvania Avenue, its eastern border, and ongoing city efforts to widen some of the streets and truck drivers' efforts to use those streets as shortcuts to I-35. "The neighborhood is always watchful of any encroachment from the east," Kutilek said, "particularly the city's desire, on an intermittent basis, to widen Yucca Avenue. The residents have been able to fight that off." A traffic sign barring trucks on Yucca is enforced by residents' watchful eyes and their willingness to report violations to the city. The active Oakhurst Neighborhood Association, started in 1981 by Kutilek's wife, Sharon, has made the neighborhood politically astute and introduced residents to each other. Participation in the association is extremely high, and the group has lobbied against street widenings and zoning changes, established a Crime Watch program and spearheaded cleanups and commercial renovation on Sylvania. A monthly newsletter called The Oak Leaflet publishes meeting times and social events, and it lists representatives from streets in the association. The community's closeness—enhanced by its geographical isolation—also benefits from neighbors' concern for each other, said the Rev. Gene Chamness, pastor of Oakhurst United Methodist Church. "People here are very caring," Chamness said. "Anytime you find caring, a community is possible." The church is an integral part of Oakhurst and provides a central meeting place and community services ranging from annual health clinics to a weekday distribution point for meal delivery to shut-ins. On Saturday, a combination auction, barbecue and rummage sale called "Fall Festival" was held on the church grounds to raise money for a family life center—a planned recreation and meeting hall. For some time now, I've been wanting to bolster the archival content on this website. Our long-time Oak Leaflet editor was kind enough to drop off a collection of old copies of the newsletter, and I set to work with my scanner. As a result, I'm happy to report that we've added 64 past issues of the Oak Leaflet to our Newsletter Archive page! While the early years of the Oak Leaflet may be a little harder to find, we are now pretty close to having the years 2006-2016 online. They are ready for you to view, download, or print today. While I'm on the topic of archival content...we're always looking for media from past neighborhood events, as well as stories that bring to life the rich history of Oakhurst. If you have photos, videos, clippings, or other media to share, please let us know. 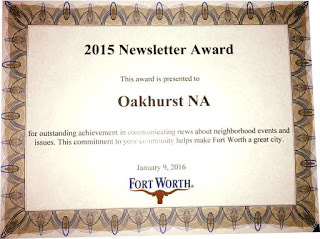 And thank you for your continued support of Oakhurst Neighborhood Association! Oak Leaflet Wins Newsletter Award! 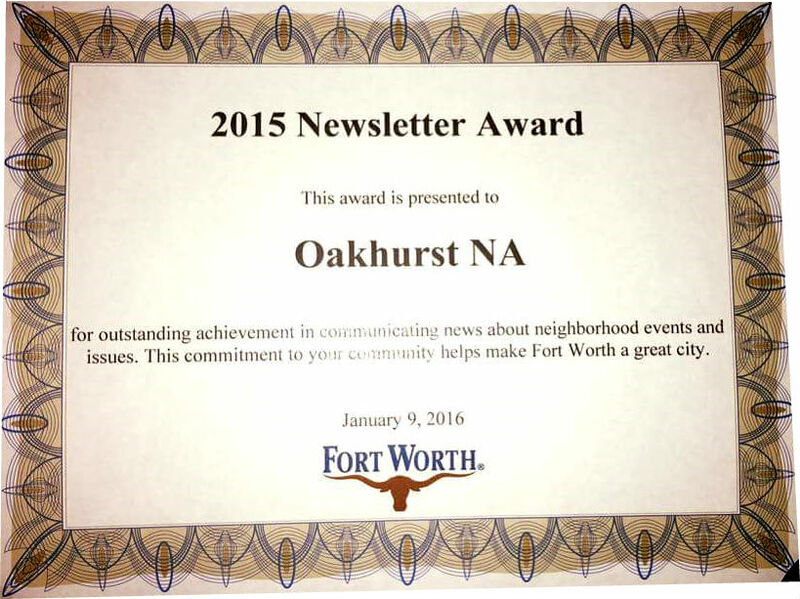 Congratulations, ONA, for winning a 2015 Newsletter Award at the annual Fort Worth Neighborhood Awards Luncheon! President Kathryn Omarkhail and Secretary Glenda Shelton accepted the award. The citation reads, "For outstanding achievement in communicating news about neighborhood events and issues. This commitment to your community makes Fort Worth a great city." This marks the second award in the past 12 months for the Oak Leaflet, which won a national newsletter award from Neighborhoods USA last spring. Speaking of the Oak Leaflet, you can read the January 2016 issue online. And read about all of the latest neighborhood awards on the City's website at this link. 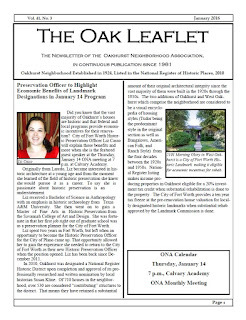 Remember to join us for the first ONA meeting of 2016 THIS Thursday, January 14, at 7pm in the Calvary Christian Academy library to hear Liz Casso present a program on economic incentives for landmarked structures! January Oak Leaflet Now Online! Check out this month's issue of The Oak Leaflet in full color online! This month's newsletter highlights our January guest speaker, recalls our Santa in the Park event in pictures, and recalls an unlikely connection between Oakhurst and Willie Nelson!